Believe in Steven.note Clockwise from the bottom: Steven Universe, Pearl, Amethyst, and Garnet. Not pictured: Greg Universe, Connie Maheswaran, Lion, Peridot, Lapis Lazuli, and Bismuth. and if you think we can't, we'll always find a way! Garnet, Amethyst, and Pearl - AND STEVEN!" 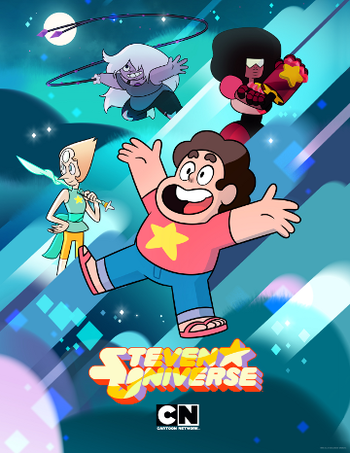 Steven Universe is a Cartoon Network show from Rebecca Sugar, an Adventure Time alum and author of Pug Davis. It is the network's first series to be created and headed solely by a woman and an openly LGBT individual.note The first animated show with a lone female creator credit was Arlene Klasky with Santo Bugito; the first Cartoon Network show to be created by a woman was My Gym Partner's a Monkey, which was done by husband-wife team Timothy and Julie McNally Cahill. Sugar's the first woman to head a CN show solo. Steven Universe has had a (non-canon) Crossover episode with — of all shows — Uncle Grandpa. Garnet was also featured in an episode of OK K.O.! Let's Be Heroes as one of the main characters. The series has a number of spin-off media detailed on the Franchise page. On July 21, 2018, it was announced at San Diego Comic-Con that a Made-for-TV Movie titled Steven Universe: The Movie is on the way, airing sometime in Fall 2019. There is a recap page, as well as a Best Episode Crowner. Warning: Unmarked spoilers ahead (not all spoilers are unmarked, just some of them). Proceed at your own risk! If every trope page were perfect, we wouldn't have indexes!